Below is a list of our wedding photography packages for weddings in Raleigh, Durham, Chapel Hill and surrounding areas in North Carolina. I also offer family portrait sessions for $150 per hour with a 2 hour minimum. An inexpensive but memorable option! Our basic package is our most affordable wedding package for those on a budget (and who isn't! ), it's perfect if you're looking for full coverage of your wedding day with all the basics covered! *There is an additional $150 charge for weddings taking place more than 100 miles from Raleigh. Our premium wedding package, still a bargain, is perfect for the busy couple who don't have a lot of time but want to make sure they have a beautiful wedding album to show family and friends. Our premium plus wedding package is for the busy couple who want it all! No need to worry about finding time for any photo projects, it's all done for you! If this package isn't quite what you want, no worries, we can customize it to fit your needs. Family photo sessions are $ 150 per hour with a two hour minimum. All edited photos are included. 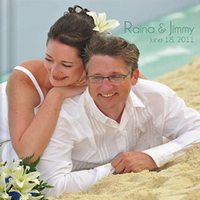 Examples of the complimentary slideshow included in every wedding package. Jamie and Matt's Wedding from chris harburg on Vimeo. Zach and Emily from chris harburg on Vimeo.